Are the chapel's mysterious stone symbols a musical score? Rosslyn Chapel was deserted when Tommy Mitchell's son, Stuart, stepped into the small antechamber one frozen afternoon last December. Savage blizzards had blanketed Scotland for the previous two weeks, and much of the chapel's staff had left early to beat the icy conditions. The cold was marshalling its forces against the scattered heat lamps inside as Stuart walked to the back of the room, where 13 stone arches crisscross along the ceiling. Stuart Mitchell, who is 45, is thin and spry with wavy brown hair and emits a rapid-fire laugh when he finds something amusing, which is often. Stuart first took an interest in the Rosslyn Chapel when his father, a former Royal Air Force cryptographer, invited him along for a visit about 10 years ago. As a professional composer, Stuart was instantly enchanted by Rosslyn's angelic stone musicians. He has come back often in the years since, but he still can't get inside the chapel without buying a ticket, which he does begrudgingly. Tommy and Stuart Mitchell in the Rosslyn Chapel. Once inside, Stuart leads me straight to the far end of the small chapel, which is supported by three broad pillars, known as the Master Pillar, the Journeyman Pillar, and the Apprentice Pillar. The Apprentice Pillar, adorned with beautiful, intricate stone flora that snakes around it like a helix, is a major attraction in and of itself. (A replica is displayed in London's Victoria and Albert Museum, and artists' renderings are sold in the Rosslyn gift shop.) But it's what sits on top of the pillars that interests Stuart—13 stone angels, each one singing or playing an instrument. The angels, with their childlike faces and great bird wings, are unquestionably medieval. By contrast, the angels' instruments are exquisitely rendered. "Any string instrument you'll see here has pegs for tuning," Stuart says, pointing to the neck of a fiddle. A lutist's fingers are positioned correctly over the frets, the finger holes on the reed instruments are in the proper places, and the pipes on an organlike device descend in length in proportion with the change in pitch they would produce. No sword or farmer's pike elsewhere in the chapel got such attention. Stone angels playing the drumlike tabor (left) and bagpipes (right). The great care that went into rendering this heavenly jam band, Stuart argues, reveals that this is not mere decoration. The instrumentation is also quite modern for 1450. The most remarkable angel is playing a set of bagpipes, one of the earliest known representations of the instrument, which had only started showing up in Scotland a few decades earlier. 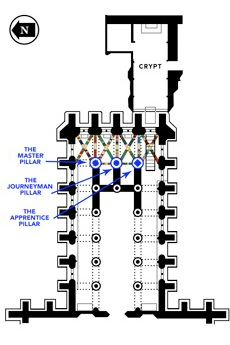 The hand-held organ depicted in Rosslyn is also unusually complex. The angels' creator, in other words, knew a lot about music, and he wanted the chapel's visitors to notice. There's one problem with speculating about the intent of Rosslyn's designer: No one knows who carved the angels or anything else in the chapel. While its patron, William St. Clair, clearly spared no expense in bringing in master masons, it's unlikely that he micromanaged the design. When Stuart contemplates the meaning of the angels and the cubes that hang above them, he attributes the creations to a singular mystery man—and he thinks that mystery man was a songwriter. "It's a very neat sound that the guy has put together," he says. Humans have a long history of conjuring meaning out of noise, particularly when they have decades to gin up a plausible-sounding explanation. But the musical solution the Mitchells believe they have uncovered in the Rosslyn Chapel is so elegant that it's hard to resist humming along. How could something that seems so natural be a fabrication? If there is any common strain here, it's that codebreakers must be creative, catholic thinkers. Tommy Mitchell's interests are indeed all over the map. He has studied ancient civilizations and Freemasonry and the stages of human evolution. He's a talented pianist and brass player, and he loves the Greek study of sacred geometry. He likes to pore over high-resolution pictures taken by NASA satellites. He also has more than a passing interest in cryptography. Tommy Mitchell (right) as a leading aircraftsman in the Royal Air Force. Sixty years after his stint in the Middle East, Tommy—now 78— credits a single road trip for changing his life. Iraq was relatively easy to traverse at the time, so Mitchell and his comrades were able to drive to the ruins of Babylon. When they arrived, they found the remnants of the ancient city-state deserted, the excavators driven away by the heat. Only a portion of the ruins had been unearthed, but Tommy was still floored by their sophistication. "Most of all," he explains in the introduction to a short book he's written about the Rosslyn Chapel, "I was impressed by the inescapable sense of antiquity, and I came away with a conviction that we in the West, with our technological civilization, had little or no idea regarding the Sumerians and how they lived." His promenade through Babylon on that scorching day put Mitchell on a quest for hidden knowledge. At the same time, he was receiving extensive training in cryptography—something he will still describe only in general terms, so as not to run afoul of the Official Secrets Act. As he left the military and returned home to Scotland, these two interests synthesized in his mind. History was a puzzle to be probed and decoded. This was mainly night work, which left Tommy the daytime to continue his spiritual explorations. He knew that God wouldn't lead him to the keys he sought. Mitchell had been to Jerusalem during his time abroad, and the bloody religious conflict left him with a bitter taste for religion. In search of a more satisfying explanation of how the world worked, Mitchell dabbled in Freemasonry before taking an interest in 20th-century English writer John Michell, whose writings cover everything from sacred geometry to the true authorship of Shakespeare's works. Michell was particularly interested in "ley lines"—ethereal routes that connect major ancient landmarks and channel great energy at places where they intersect. In his free time, Tommy began tracing these lines around Edinburgh. One led him five miles south, to the doorstep of Rosslyn Chapel. Mitchell doesn't remember the precise day he first stepped into the chapel, but he places it around 1971. In those days Rosslyn was in a pretty sorry state, its waterlogged stonework threatening to collapse. The chapel was still open to the public, but you had to get a key from a woman in town to get in. There wasn't a commemorative T-shirt or coffee mug to be found. Undeterred by the chapel's shabby condition, Tommy believed that great meaning was concealed within its walls. Year after year, he puzzled over the strange symbols on the stone cubes at the back of the chapel. They reminded him of the Enneagram, a geometric symbol he'd come across while investigating the teachings of G. I. Gurdjieff, an obscure mystic who believed in reaching higher planes of consciousness through guided meditation. The Ennegram, a series of straight lines circumscribed by a circle, represents Gurdjieff's teachings about the relationship between the body, the heart, and the mind. Tommy searched deeper into Gurdjieff's teachings for anything resembling the Rosslyn symbols. He came up empty. He moved on to Freemason imagery, ancient mathematics systems, Pythagorean geometry, and even quantum physics. Still no match. Years would go by during which he wouldn't think about the chapel much at all before some new clue would reignite his fascination. "My wife would say to me, You going to sit there all night?" he recalls. Tommy talks about his early quest with the awareness that it sounds a little kooky, but he's unapologetic. "I'm not a conspiracy freak, but I have found that after everything I have studied, I have a very open mind now," he says. Tommy's undiscriminating attitude ultimately guided him to a promising lead, some 30 years after he first came across the chapel. The cubes' placement directly above the stone musicians, he hypothesized, could mean that the carvings had some sort of musical aspect. At this point, he recalled an obscure tidbit he'd gleaned while studying the properties of the musical scale years earlier—something to do with patterns associated with notes. Around 2000, Tommy asked his composer son to have a look, and Stuart soon dug up the name of the symbols. They are called Chladni patterns. Chladni came up with a simple technique to deduce an instrument's microscopic movements. First, he spread sand along the instrument's surface. Then he vibrated it with a bow and observed where the sand collected. The resulting pattern revealed the material's minuscule oscillations, previously unobservable to the naked eye. Using modern machinery, it's possible to cycle through a huge number of Chladni patterns in a few minutes. Watch the video below, in which sand on a vibrating plate transitions from one pattern to the next. Each pattern corresponds to a specific frequency. It's easy to see what Ernst Chladni discovered during his experiments: The sand patterns grow increasingly complex as the frequencies get higher. For a low note, you might see a simple diamond. Jump up a few octaves, and you get a rosetta. Go up still higher and you see patterns reminiscent of what a piece of paper looks like when you fold and unfold an origami animal. About 100 years after Chladni's discovery, another scientist named John Tyndall produced a chart of the patterns that's still in circulation today. Finding Tyndall's chart was a eureka moment for Tommy and Stuart Mitchell. Several Chladni patterns resemble the cubes in the chapel, and others are at least fairly similar. The resemblance isn't unmistakable, but it's eerily close. For the Mitchells, the implication was clear: The code in the ceiling of the Rosslyn Chapel was not a message written out in letters. It was a melody, and each cube represented one note. There was only one problem. The chapel was built in the 15th century. Ernst Chladni wouldn't be born for another 200 years. Correction, May 17, 2011: This article originally referred to the wrong John Michell, an 18th-century science writer and philosopher.